A guest appearance by Northamptonshire’s Richard Gleeson couldn’t spare Blackpool from a second defeat of the season in the Northern Premier League, while St Annes closed the gap at the top with an impressive derby win away to Fleetwood. Chorley convincingly beat second-placed Blackpool by seven wickets at Stanley Park, where the home side could take some solace from leaders Netherfield being held to a draw by Penrith. Fourth-placed Chorley put Blackpool in and removed them for 128 in 45.5 overs. A more meagre total looked likely at 55-7 but then Matt Grindley came to the crease and struck 43 from 59 balls. Openers Matt Houston and Ciaran Jonnson were Blackpool’s next-best with 15 apiece. Four Chorley bowlers claimed two victims and all six enjoyed success as the wickets were shared between an impressive attack, Stuart Naden’s six overs yielding only three runs. Grindley soon dismissed both Chorley openers but his side enjoyed only one further success as Gayan Maneeshan’s unbeaten half-century guided the Readers T20 champions to victory at 131-3 with 9.4 overs remaining. The number three made exactly 50 from 78 balls, with four fours and a six, while opener Wian van Zyl chipped in with 36. Gleeson bowled nine tidy overs without a breakthrough on his old stomping ground. Blackpool are 13 points behind the leaders following the surprise result at Netherfield, where Penrith came within three runs of victory. There was a nailbiting finish at Broadwater too, where St Annes’ Mohamed Nadeem took the final Fleetwood wicket with two balls remaining to seal at 38-run win. Fleetwood’s Neels Bergh has grabbed most headlines among the Fylde coast professionals this season but his St Annes counterpart Amar Ullah was the star of Saturday’s show, top-scoring with 55 in his side’s 193-9 and then claiming 4-48 from 17 overs. After the visitors had been put in, Ullah struck seven fours in his 98-ball innings, sharing in stands of 54 for the fourth wicket with Nadeem (20) and 66 for the sixth with Gurman Bains (28) before falling to Alex Ryder (3-57 from 13 overs). Sam Bell’s three victims (for 47 from 15) were all members of St Annes’ top four. After the reply started shakily (11-2), the league’s top run-scorer Bergh gave Fleetwood hope with 43, though partners deserted him and when the South African was eighth out at 125 it was all about clinging on for the hosts. They couldn’t quite do so and slip below Leyland into seventh, while St Annes are 10 points behind Blackpool in third. Fleetwood and St Annes both fell at the first hurdle in the NPCL’s 40-over knockout competition. St Annes went down by six-wickets at Fulwood and Broughton and Fleetwood by 67 at Kendal in the first round of the rebranded Benchmarks Kitchens and Joinery Trophy. Kendal chose to bat and their top-order impressed to set Fleetwood an imposing target of 268-7 at Shap Road. Lachlan Stewart shared in stands of 94 for the first wicket (James Park 43) and 86 for the second with Shubkham Kajuria, who top-scored with 75 from 49 balls. Fleetwood replied with a solid second-wicket stand of their own as Bergh and skipper Dean Bell (33) compiled 80. Professional Bergh went on to reach 70 from 67 balls (10 fours), but his dismissal with the score at 145 triggered a flurry of wickets and Fleetwood closed at 201-8, Kajuria completing his fine day with 3-30 from eight overs. St Annes chose to bat at Fulwood but were dismissed for 160 with 10 balls remaining as Chris Brookes and Arbrab Munir took three wickets each. Henry Higson fared best for the visitors with an unbeaten 26 batting number nine. Lancashire’s Simon Kerrigan then carried his bat for 75 as the hosts cruised home at 166-4 with 7.2 overs unused. Winners Fulwood and Broughton and Kendal will face each other in the quarter-finals in a fortnight. Blackpool’s first-round tie at Netherfield has been moved back to this coming Sunday. The winners will host Barrow, who crushed Morecambe by 159 runs. Lytham’s encouraging run of Liverpool Competition form ended with a batting collapse and a six-wicket defeat at Rainhill. The visitors chose to bat in St Helens and looked on course for a competitive total as top-scoring captain Ben Saunders (47 from 43 balls with nine boundaries) and Tom Jefferson put on 66 from the fifth wicket. But Jefferson’s exit for 35 sparked a disintegration from 113-4 to 121 all out in 39.2 overs, with opener Taylor Cornall (19) the only other Lytham player to score more than six. David Atkinson ripped through the lower order for 5-20 from seven overs, Ryan Williams having dismissed three of the top five for 49 in 13. Two early wickets gave Lytham hope but Rainhill opener Tyler McGladdery was unmovable, finishing unbeaten on 47 from 68 balls (seven fours) and sharing in a fourth-wicket stand of 54 with Ross Higham (27) as victory was sealed in 31.3 overs at 122-4. Rainhill remain fifth and Lytham seventh in the ECB premier league table. Luke Jardine’s half-century and five wickets for Neil Ashford helped South Shore to a Palace Shield derby win over Thornton Cleveleys and Longridge won the clash of the premier division’s top two with Lancaster. Division 1A has new leaders in Hoghton after their victory over Norcross. 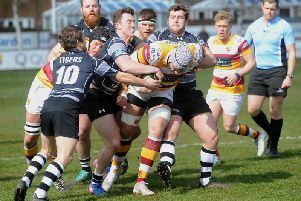 Fylde climb into the top four as former leaders Freckleton’s slide continues, and Kirkham and Weham slip into the bottom half after becoming the first team to lose to bottom club Withnell Fold. Moore and Smalley Palace Shield premier division: Croston 167-4 beat New Longton by six wickets, Eccleston 180-9 beat Penwortham 178-8 by one wicket, Great Eccleston 200-8 (M Rigby 47no, J Cookson 3-26 ) lostto Torrisholme 205-5 (D Woods 82no, A Jariwala 3-55) by five wickets, Kendal 185-2 beat Vernon Carus 184-9 by eight wickets, Longridge 162-3 beat Lancaster 158-7 by seven wickets, South Shore 142-9 (L Jardine 59, G Tirell 5-24) beat Thornton Cleveleys 117 (N Ashford 5-37) by 25 runs. Division 1A: Freckleton 82 ( A Hogarth 35, D Hodge 6-47, R Lyon 4-30) lost to Rufford 230-5 (G Ashcroft 82, R Lyon 52) by 148 runs, Fylde 191-8 (D Smith 39no) beat Grimsargh 190 (M Hitchen 56, A Ellison 5-56) by two wickets, Kirkham and Wesham 91 (K Valimulla 6-26, N Fowler 3-30) lost to Withnell Fold 189-7 (G Green 45, R Javeed 45, J Hogarth 4-37) by 98 runs, Mawdesley 126 lost to Tarleton 128-1 by nine wickets, Norcross 107 (M Culbert 4-8) lost to Hoghton 144-8 (D Eccles 67, R Blampied 3-21) by 27 runs, Standish 231-7 beat BAC/EE Preston 200 by 31 runs.